The 2013 Youth European championships for women at U16 level are organised for girls born from 1 January 1997. The Division A and B tournaments are scheduled to run from 1 August until 11 August in Bulgaria and Portugal. A third European Championship, called the Division C championship, is held in Gibraltar on a date yet to be decided. France are one of 16 teams competing in the FIBA Europe U16 Championship for Women Division A in Varna, Bulgaria. This edition of the A championship is also a qualification tournament for the 2014 FIBA U17 World Championship for Women. The prize for the top five teams at the end of the European Championship is a ticket to the world championship. The competition format remains unchanged from last year with three teams going down to and three teams coming up from Division B. In Division A the bottom team from each group at the end of the preliminary round must play in the relegation round. The winner of the relegation round remains in Division A while the other three teams are relegated to Division B. In Division B the three medallists win promotion. For this edition 17 teams contest for the Division B title. Amongst them are Serbia, one of the power houses of youth international basket, who are playing in Division B for the first time in their history. 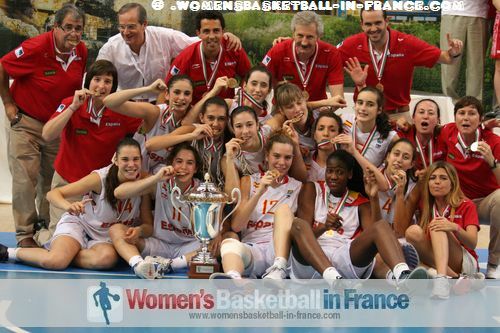 Spain are the Youth European Championship Queens at this level with seven titles since 2004. They start defending their title in Group A with matches against Greece, Bulgaria and Croatia. France have been drawn in Group D alongside the Czech Republic, Hungary and the Slovak Republic. France finished in fifth place in 2012 and are looking to finish no lower than fifth place this time around so as to qualify for the 2014 U17 World Championship for Women. Group C could be viewed as the group of death with Belgium, Italy, Lithuania and the Netherlands. All four nations have solid youth programmes and a number of good players in the 1997 age group.